Land Cover Map 2015 (LCM2015), released in April 2017, is our latest land cover map. 2015 marked 25 years of Land Cover Mapping in CEH. National-scale land cover mapping began in 1990 with LCM1990, continued with LCM2000 and then LCM2007. The series was complemented by CEH Land Cover® plus: Crop Map and is now joined by LCM2015. LCM2015 is derived from satellite images and digital cartography and provides land cover information for the entire UK. Land cover is based on UK Biodiversity Action Plan Broad Habitats classes. It is used by government departments and agencies, county councils, charities and commissions, as well as environmental management bodies, consultancies and researchers. It has wide application in many sectors and is available in different formats to suit the requirements of users. LCM2015 comes in a range of data formats (same as LCM2007) and at a range of thematic and spatial resolutions to support the diverse range of applications. The 'core' product is the LCM2015 vector from which the 25m raster is derived. The 25m raster is then used to produce the 1km products. Comparison of the level of spatial detail in the vector product, 25m raster product and 1km dominant cover raster product for an area ~ 35km x 35km (top images) and ~ 6km x 6km (lower images). © NERC (CEH) 2017. © Crown Copyright 2007. Ordnance Survey Licence number 100017572. The most detailed product is the vector, where each polygon represents a parcel of land and has attributes describing land cover and metadata describing how this information was derived. A 25x25m raster gives the most likely Broad Habitat for each pixel. 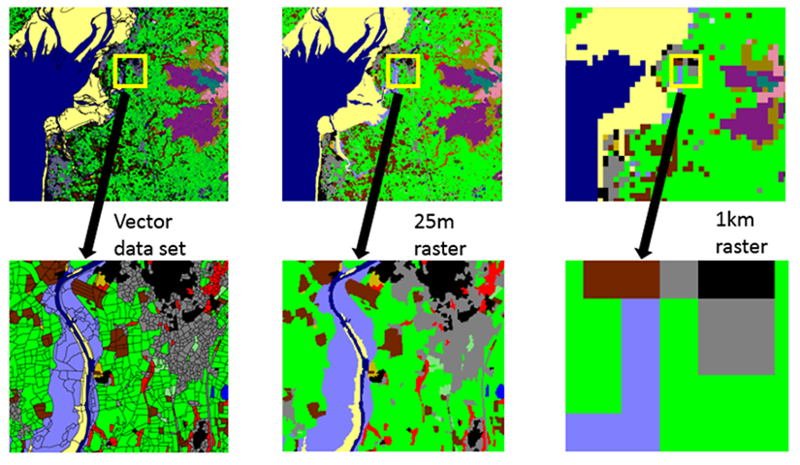 Four freely available 1x1km raster products summarise the 25x25m raster. LCM2015 is available under licence from the CEH Data Licensing Team. Please make a request using the form below or telephone +44 (0)1491 692716 for more information. For Academic Research/Education only, all CEH’s Land Cover Map datasets are available for free via EDINA, specifically the Environment section, and via the JISC Geospatial Data Service. LCM2015 is also accessible via the CEH Environmental Information Platform where there are links to the various products. LCM2015 1km raster data can be freely and directly downloaded. For the other products, once your request has been received, the Data Licensing Team will be in contact. LCM2015 is available for academic research, educational use, non-commercial use, commercial use, personal use, Value Added Reselling and innovation. Price is based on the use to which the data will be put (e.g. academic research, commercial use), the data format and the area required. It is called LCM2015 because it is based primarily on satellite data acquired during 2015. LCM2015 covers the whole of the UK. LCM2015 maps 22 land cover classes. The classes are the same as LCM2007, but without Rough Grassland and Montane. A straightforward comparison of LCM2007 with LCM2015 will not accurately indicate change. Detecting change is complex. However, CEH’s new techniques have been designed with change detection in mind so we anticipate improvements in the future. A new, quicker methodology means that LCM2015 has been released faster than previous Land Cover Maps. LCM2015 uses the same spatial framework as LCM2007 and the CEH Land Cover® plus: Crop Map. But for 2015 no segmentation has been incorporated into the spatial framework, unlike LCM2007. LCM2015 is based primarily on Landsat-8 data, so there is no difference in spatial resolution compared to LCM2007. Sentinel-2 data was not used because it only began routinely acquiring calibrated data at the end of 2015. For more information, please contact the CEH Data Licensing Team at datalicensing@ceh.ac.uk.